Daredevil #160: Did your boyfriend give you that? Did your boyfriend give you that? Hey gang and sorry for not posting for a few days, but I’ve been a very busy bee cleaning out my apartment from top to bottom (I’m very proud of myself!). As you may already know, the preview for this week’s Daredevil: Reborn #1 went up on CBR on Friday. It’s Matt Murdock being, well, Matt Murdock and I’m really looking forward to a nice change from the last few months where we didn’t get to spend much time at all with the man behind the mask. I have a slightly longer post planned for tomorrow and on Thursday or Friday, I hope to get to my review of Daredevil: Reborn #1. Meanwhile, I just felt I wanted to share a little finding I made while looking through some old issues. 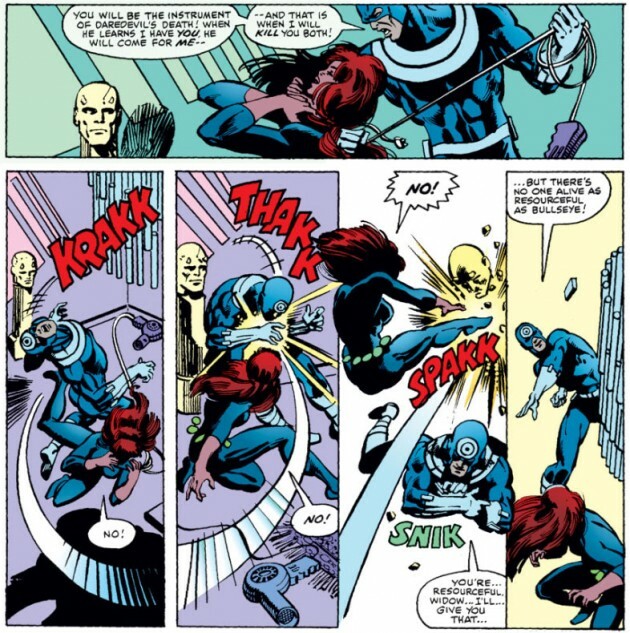 The panel below features an encounter (a surprisingly violent and graphic one at that) between Bullseye and the Black Widow, from Daredevil #160 by Roger McKenzie and Frank Miller. This attack takes place in Natasha’s home, and a particular piece of decor caught my eye. Do you guys see it too? I mean, really, what is she doing with a statue of her ex-boyfriend’s head? True, it could be the actual devil or some other random guy with horns growing out of his head, but I suspect that’s really meant to be our very own “hornhead.” It’s probably a little in-joke supplied by then penciller Frank Miller, but it does raise all kinds of questions: Did Matt buy that for her? Before or after they broke up? How big is his ego, really? Did Natasha buy it herself? What the hell is wrong with her? So many questions, so little time. Now, it’s time for bed on my side of the planet. You guys take care and I’ll get back to you soon! i think… what is she doing with a statue of her ex-boyfriend’s head, is very simple …she still loving daredevil. 1. Matt and Natasha visited Alicia Masters and got their heads done together, much like a none ‘super’ couple might go and paint mugs or something on a quiet weekend. After the break-up Natasha just decided to keep hers around the house, it’s quite heavy and she’s kind of used to it, occasionally dries a blouse on it or uses it to store hats on. 2. like the Black Widow spider, Natasha keeps the head of each of her lovers (albeit in statue form). She has a shelf in the study full of them, but the eyes follow her around the room and creep her out a bit. Not a problem with Matt who she keeps in the living room. Is it just me or does its expression brighten when Black Widow starts really winning the fight? Matt looks stern in panel 1, but by panel 3, he’s got a little smirk. @ Aaron, I’ve read this issue like 500 times and never noticed that before, but your totally right. If you look close at the statue with the stand it looks like a giant Pez dispenser. Natasha seems quite mortified at the damage done to DD’s head as well. Also I find that preview for Reborn very reminiscent of Miller’s Badlands issue (#219). Anyone feeling that too?